So, I have kind of the same problem as some other people on here, but then different. I also want to install windows on my Mac. I also get the problem where it says I do not have the required 40 GB of free space. But any solution I can try on the internet doesn't work. "The sudo tmutil thinlocalsnapshots / 999999999999" doesn't work, nothing works, and it frustrates me to the max. Apple support does not really help either because they just keep telling me to clear out mor space. I am currently at almost 50 GB of free space, but now they want me to go get 55 while I read that even people with 100GB free have this problem. Any suggestions? This answer is in respond to you post comment which I have repeated below. In that case I will go and look for other ways to install windows, I have seen some stuff about installing it without bootcamp. The basic steps needed for your 2017 Mac have been post as the accepted answer to this question: How to install Windows 10 into a 2013 iMac without using the Boot Camp Assistant, USB flash drive or third party tools? If you edit your question and include the output from diskutil list, I could post the steps for your particular situation. The numbers do not look good. If you shrink your macOS partition to the minimum recommended size of 95.6 GB, then you can create 25.5 GB of free space for Windows 10. (In other words: 121.1 GB - 95.6 GB = 25.5 GB) This Microsoft website states you will need 20 GB to install Windows 10, but the Boot Camp Assistant creates a temporary partition to hold the Windows installation files. This additional space is larger than the difference between 25.5 GB and 20 GB. The Boot Camp Assistant will not install Windows because there really is not enough free space. One possible solution would be to use a 16 GB or larger flash drive to hold the Windows installation files. Once the files are transferred to the flash drive, you could delete them from the macOS volume and thus create more free space. One possible procedure to install Windows 10. Use the the Boot Camp Assistant to download the latest Windows Support Software for your Mac. Look for the "Action" pulldown on the Boot Camp Assistant menu bar. On my Mac, these files were downloaded to the ~/WindowsSupport directory. Create a FAT32 formatted volume labeled "BOOTCAMP" on the 3rd partition of the primary disk. Basically, enter the command below in a Terminal application window. 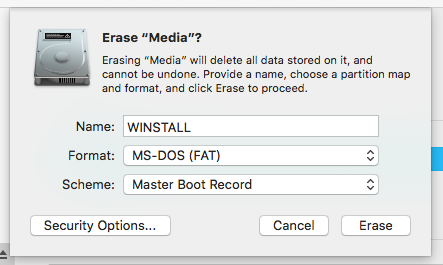 Use the Disk Utility application to erase a 16 GB or larger flash drive. Choose the parameters shown in the image below. Mount the Windows iso file and copy the contents to the "WINSTALL" volume. In my case, the label "ESD-ISO" was used to identify the Windows iso. To perform the copy operation, you will need the enter the cp command from a Terminal application window. Below are the commands I usually enter. If necessary, make the appropriate modifications. Copy the Windows Support Software to the "BOOTCAMP" volume. Below is the command I usually enter. If necessary, make the appropriate modifications. Next, you need to boot from the flash drive. Hold down the option key immediately after restarting your Mac. Release the option key when the Startup Manager window appears. Select the icon labeled "EFI boot". Next, select the arrow below the "EFI boot" label. Install Windows. When asked: "Where do you want to install Windows? ", proceed as follows. First select the "BOOTCAMP" partition. Next, click on the "Format" button. Finally, click on the "Next" button. If the Mac boots back to macOS, goto the Startup Disk pane of the System Preferences application, unlock, select Windows and click on Restart button. Windows will continue installing. When Windows finishing installing, make sure the Windows Support Software is installed. :EDIT: I had the same issue with a client and found a better solution for freeing up the "Purgeable space" on the Mac without erasing your whole drive. Why we have to do stuff like this to get our own space back I'll never know... eh hem Apple? I see that the original question has changed but I thought I put this out there anyways. You need to uncheck the Desktop and Documents in iCloud. Now that you are not storing your files in the cloud what you have to do is make a folder anywhere on your Mac. Here is where it gets fun ... maybe not so much. The end goal is to fill your HD / SSD up to the brim and then delete that data you just put there. This will force the OS to free up the purgeable space and then you can just delete the data you just created and viola! Space back on your Mac. First Create a folder on your desktop. Then You need to find the largest folder on your drive in your home folder and copy it to the folder you just created. keep duplicating it inside the folder you just created for ease of use. What this does is fill up your drive and force the OS to make room by deleting the purgeable space. When you are all filled up you just delete the folder on your desktop that had all the duplicates and ... BAM free space. Since you've tried removing time machine local snapshots then the only course for you to take is to remove your Recovery Partition. You will need a few things before doing this. a usb installer of High Sierra which you can google how to do. 2. select Disk Utility, then go to the View Tab and select show all disks. 3. Select the main HDD (Top one) and erase it in GUID format. 4. Reinstall OS X High Sierra. 5. Migration assistant your data back. !! It should be noted that having a Recovery partition is nice to have. You won't be able to just reinstall OS High Sierra from that partition if something goes wrong. You'll need to have the USB installer for that from now on. I had the same error 4 days now searching what is the problem. The big problem here is that your image drive has a file over 4 GB (install.wim) and the usb format is FAT32 which can't handle over 4GB files. The solution was a program I found on internet which splits the install.wim folder to smaller. There are excellent commercial programs to make managing BootCamp data and partitions and setup scriptable, repeatable and automated / click the button easy. Not the answer you're looking for? Browse other questions tagged bootcamp windows disk-space .